A Visit to Bodega Vereda Real…In Search of Bobal Blanca. One of the great pleasures of moving to a new area is to learn about local grape varieties and so far Valencia has not failed. The fabled Plantafina de Pedralba may have all but died out in DO Valencia ( a friend believes he knows where there is an abandoned parcel) but it lives on in DO Utiel-Requena as Tardana or Planta Nova. Bobal is the great find of Utiel-Requena, the versatile variety has produced white wine, white cava ( both from red grapes) rosados, a rosado cava as well as joven, crianza and reservas in red and sweet reds. The trouble is the whites have been from red grapes from the variety presumably using the special carbon filter to remove the colour whilst leaving the flavours intact in the wines. Covilor had a white in their Succesión range in 2007 and of course Pago de Tharsys produce their excellent Unico Blanc de Noir cava from red Bobal grapes . Verema´s forums briefly debated the existence of the variety in 2005 without reaching a conclusion. Certainly from my research in the text books I have, ( André Simon, Jancis Robinson, Stephen Spurrier, Alexis Lichine, Jan Read, or local writers such as Joan Martin and the expert Juan Piqueras) most acknowledge the red variety but the only reference I could find to a white variety was on Wikipedia´s site which blandly states there is a white variety, full stop. Ok, so when I recently visited the stand of Vereda Real in the recent edition of Ferevin and tasted their new range of Mediterranean varietals ( Bobal Blanca, Tardana and Moravia) my appetite was whetted to find out a little more! 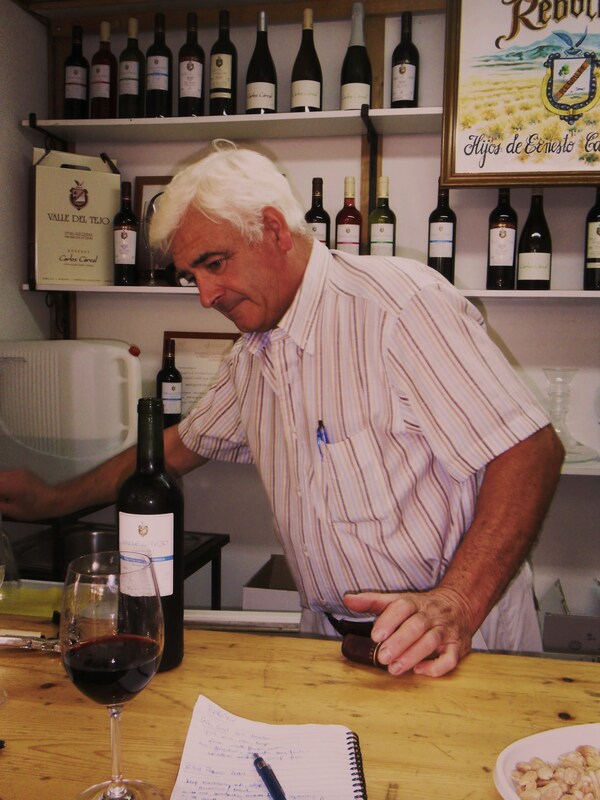 Vereda Real, under technical director Pedro Cárcel Garcia, is a new bodega, experimental in nature and the only bodega actually within the city of Requena. Pedro welcomed us to the bodega and showed us around the facility. The grapes are processed, once picked, in other facilities, the wines themselves moving into the bodega to age in one or other of the barrels, barrel boxes or tinajas. In the 43 hectares of vineyards they grow Bobal, Cabernet Franc, Cabernet Sauvignon, Merlot, Petit Verdot, Pinot Noir, Syrah, Planta Nova ( Tardana) Chardonnay and Bobal Blanca. They also have Moravia, an autoctonal variety coming from Casas de Ibañez in Castillo de la Mancha and Moscatels in the Alicante region. When the barrel box was first introduced it allowed wine-makers to combine French, American, Hungarian and Caucasian oak each of which adds separate flavours and tannins to the wines. Today Pedro is clear that he is more interested in combining French oak varieties for his wines, especially Bobal which he believes does not marry well with American oak. So for example you may find barrels in the basement which are Allier staves and Vosges ends, a variety of medium or medium+ toasting. These provide a greater element of balsamic and menthol notes and fresher wines which is what Pedro is seeking. However he has not yet decided what is the best combination and the experimentation continues. 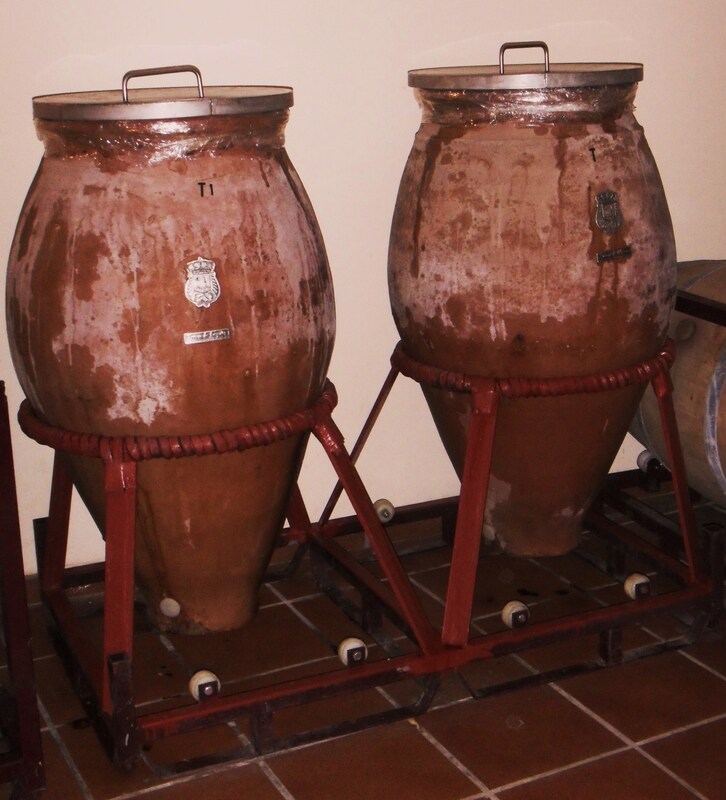 To this end the new vintage of top wine `Tesoro de Requena´ from Bobal is either in the barrel boxes or the two tinajas, new terracotta vessels which were all the rage until concrete and then stainless steel took over! Certainly terracotta amphorae have been in use for 2500 years in the area. The aim is to see what influence terracotta has on the wine. 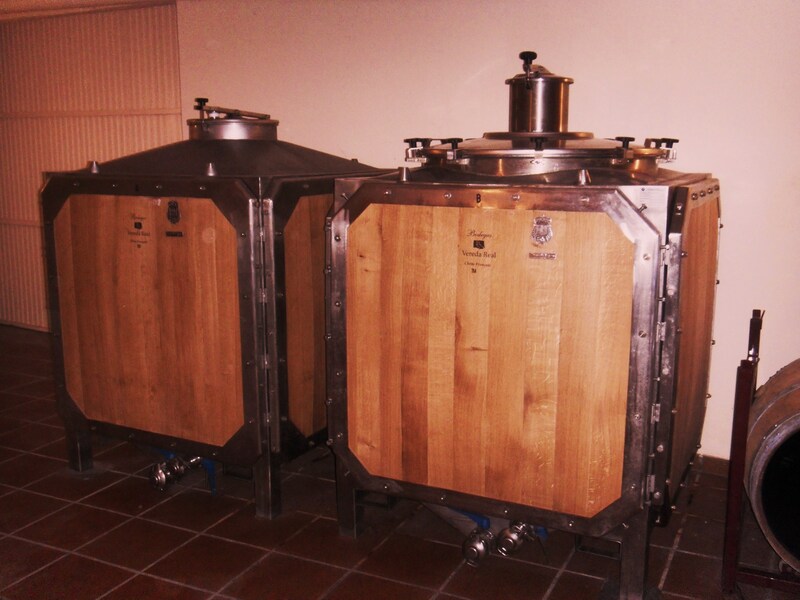 Each is 225 litres, the same size as a normal oak barrel and time will tell how the wine ages in the different vessels. And as with the Burgundians, Pedro has oak especially for fermenting white wine. This is used for the Bobal Blanca for example which spends two months fermenting and then under going battonage before stabilisation in stainless steel and then bottling. To aid the battonage Pedro uses acrylic ended barrels so that he can see when all the particles in the young wine have dropped to the bottom! So, back to the Bobal Blanca…..can we see the vineyard please? Pedro was delighted we had time to go and look. A drive out-of-town and up into the hills beyond the motorway is all I am going to say about the whereabouts of this parcel of rare vines. Certainly the vineyard is well above Requena at around 900m. How did Pedro find them? By chance! He was cycling ( well mountain-biking ) when he passed some locals and asked about the vines which subsequently he is now managing. Bobal Blanca. Classic Bulls Head Bunch. Up here there are abandoned plots of vines in the sandy soil full of river stones, arid and red. Pedro has been trying to recover some of these plots, an expensive and time-consuming exercise, the reward for which is ( or are ) old vines with superb quality production, concentration and historic interest. Bobal is widely planted in Requena and has many clones. But little is known of these and studies need to be carried out to evaluate which clones are best for which soil, how to best exploit them etc. Currently what is known is that young vines do not necessarily produce good wines for the Utiel-Requena trade-mark. Up until around 40 years they are good to export to bulk up and blend with other wines ( Rioja eg) but then start to produce good rosados, until at around 80 years of age they produce reds capable of long ageing once the bunches begin to become more compact with smaller berries. Less production, better quality and concentration. In Pedro´s parcel you can see the different clones. All are in `Vaso´ and about 85 years old. There are certainly two white varieties one with the classic bulls head bunches of compact small grapes the other with looser smaller bunches and the odd red vine mixed in. The vines are low, hugging the hill where the wind blows keeping the vines clear of disease, gnarled but healthy! 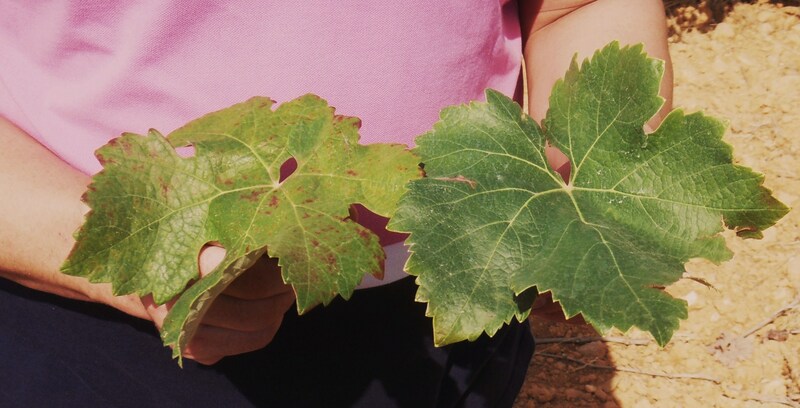 The leaves are practically identical ( a small colour differential ) but the shape the same and the grapes identical in shape and size and only different in colour. Leaf Variety, White and Red. Vereda Real are now selling the wine as a monovarietal, together with a Tardana and the Moravia from lamanchuela. In the shop you can also buy the full range of wines from the white Macabeo ( around 3.50€) to the top of the range Tesoro de Requena in its heavy bottle and presentation box for 40€ . The wines ( most under 7€ are not generally available in Valencia, around 90% going abroad and to restaurants in particular. 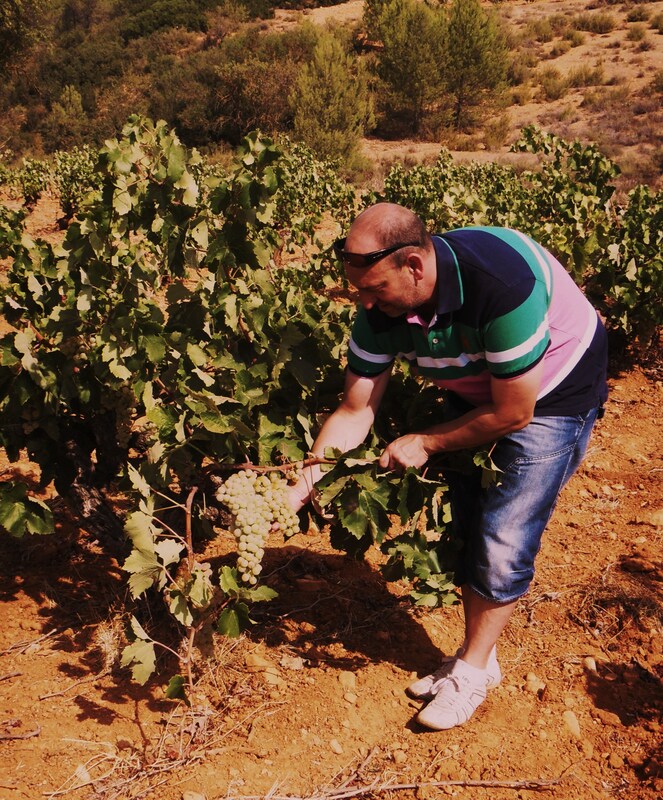 Pedro has his market but the Mediterranean varietal range deserves a better and wider market. The Tardana and Bobal Blanca in particular are rarities, especially if rumours that Torroja are no longer producing their Sybarus wines prove to be correct. The Moravia also is a wine worthy of further investigation with it´s Syrah like comparisons. So how does the Bobal Blanca taste as a finished wine. For certain it needs to be served chilled. A pale yellow in colour, clean and very bright. On the nose white fruits, perfumed, medium intensity. In the mouth white fruits, pear, full with a hint of tropical fruit, but floral as well, acacia. Well balanced with a good long finish. Very distinct. I love it here….always something new to look for and sample and write about! Part of the Parcel of Vines. 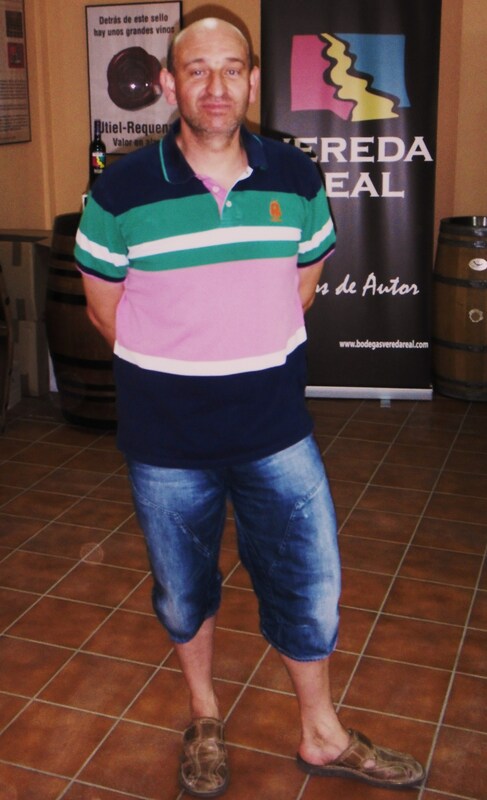 Ferevin 2012- A Fair that Celebrated the Best Wines Of Utiel-Requena! Carlos Carcel. President of Ferevin. 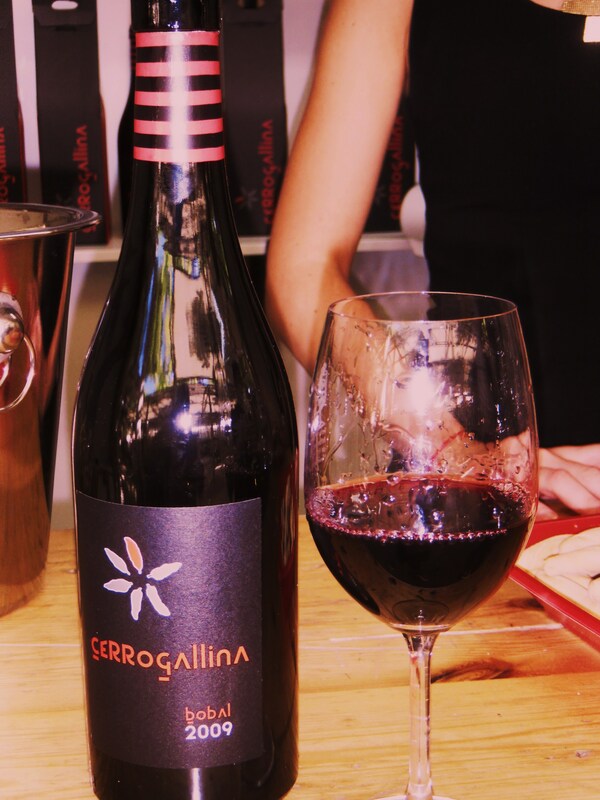 I have always enjoyed going to Ferevin, celebrated over the last weekend of August, Requena´s Wine Fair is an opportunity for the Utiel-Requena region to demonstrate why its wines should be known all over the world! I have made many friends in the region, genuine friends, and found wines which are outstanding. This year the fair seemed all the better, the wines were better, the ambience better and more friends were there to be met. Moreover the region always has something new `up it´s sleeve´ as we will discover in the following paragraphs. Now, let us put 2012 into context. Worst financial crisis ever…..best wine sales for the region, exports up, quality up and the vintage, if smaller, looking to be excellent again! Wines from Utiel-Requena are finding new markets worldwide, even the UK has discovered the local grape variety Bobal and is taking it to its collective heart! And what wines there were from Bobal…..2011 has produced wines of excellent quality and both the rosados and joven tintos from this vintage were showing spectacularly! Cava is also produced here and we were to enjoy a number of cavas of incredible quality, many of them being International award winners. Sit back, dear reader and enjoy that which excited the many English visitors to the fair this year…..and then plan your trip for next year! 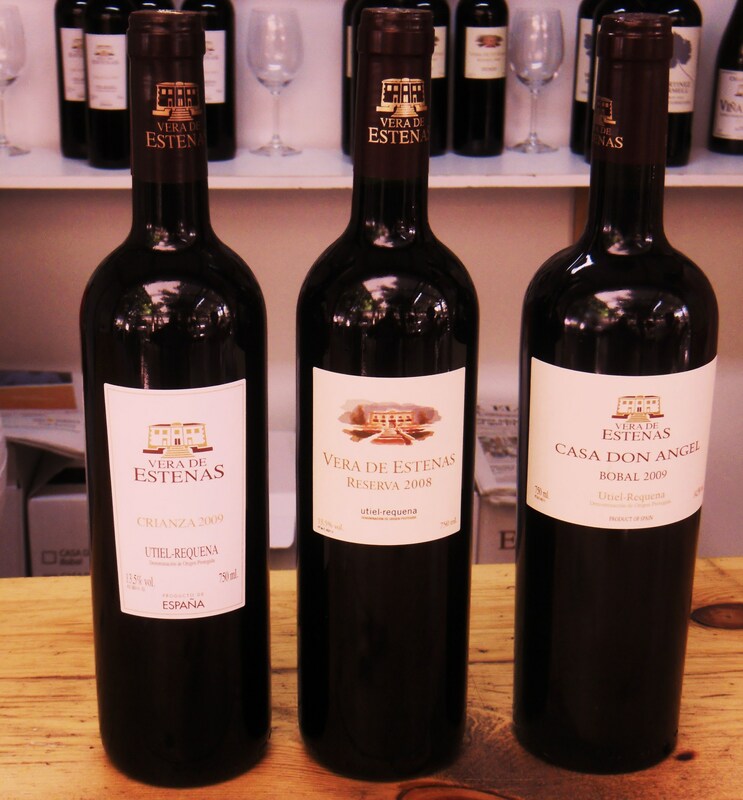 Vera de Estenas, three new reds. We commenced with a visit to the stand of Carlos Carcel, President of the organisation whose bodega, Bodega Carlos Carcel is based in El Rebollar. The 2011 Macabeo is a pale lemon colour, clean and bright in the glass and with a fresh bouquet of white flowers, melon and hints of wild fennel. In the mouth it is a perfect wine for a hot evening….fresh with good acidity, grapefruit, and a long crisp finish with hints of minerals. A big refreshing mouthful that invites you back for more! Carlos is a pioneer, best winemaker of his generation and his Bobal Maceration Carbonica 2011 is the only one made in this style in the region. The 2011 vintage was perfect for the variety and here you have a cherry red wine, good deep colour with all sorts of berries exploding out of the glass, a red and black fruit salad which in the mouth is very fruity with a good long finish…an easy drinker. At the top end of the scale is a far more traditional Bobal Reserva from 2001. A wine which belies the traditional view that Bobal is only good for rosado or shipping to bulk up Rioja! Here was a wine which is deep blackberry in colour, with a red edge, a wine whose period in French and American oak gives it mature fruit, balsamicos, liquorice. In the mouth it is initially lean but with a big fruit background which lingers long in the mouth. A wine for serious food! Our tour continued at the stand of Vera de Estenas who commence their harvest today although this will be 25-30% smaller than last years because of the lack of rain. Félix Martinez is visibly excited by the prospects though, especially for the Bobal which has perfect, tight small bunches of grapes and will be picked earlier than usual. Three new red wines have just been released for the market! Somewhat younger than Carlos Carcel, Félix Martinez is the wine-maker of his generation. 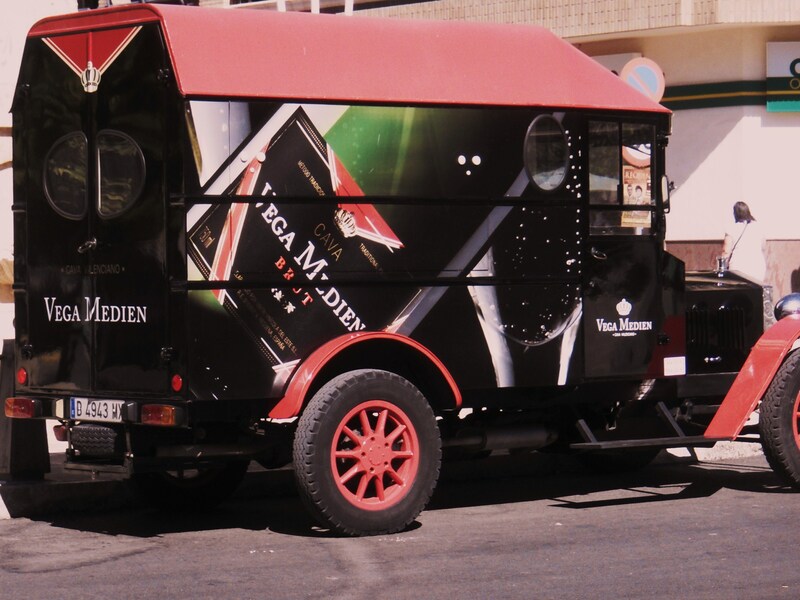 The bodega is one of the most attractive in the region. First wine was the Crianza 2009, a blend of Cabernet Sauvignon, Bobal, Tempranillo and Merlot and is `madurado en barrica.´ A medium bodied cherry red of 13.5% ABV it has the customary long legs and on the nose cherries, red and black mature fruits, blackberry, plum, which as it easily crosses the palate displays jam, leading to a long , lean, smooth finish. The 2008 Reserva is a blend of the same varieties but with longer in wood. A slightly deeper cherry red the mature fruit on the nose is joined by hints of oak, vanilla and spice ( cinnamon and nut-meg) . In the mouth the fruit is well-developed, the wine very well-balanced, silky smooth with an easy pass across the palate. A wine with a long future in bottle! Vera de Estenas is renowned for its Bobal and the 2006 Casa Don Angel which I had previously tasted from deposit and barrica is now bottled and released. 100% Bobal from vines with around 110 years of age it is 14.5% ABV. A very deep dark cherry red with a violet edge, it has very long glycerinous legs. On the nose the mature fruits are jammy, spicy, showing liquorice and hints of smoke. In the mouth the wine is well balanced with good fruit, quite forward for a wine this young, smooth tannins, a long finish which displays large bursts of fruit……fabulous wine for long keeping! Carlos Carcel´s brother Ernesto together with his wife also makes wine in El Rebollar. They prefer to only use American oak and we tasted three outstanding wines from the bodega in the company of Cristina and Belen, their daughters. These showed how well this works with the regions wine and helps to display the terroir of the region. A big favourite of mine is the 2007 Macabeo Blanco Crianza. A golden colour, clean and bright the wine displays plenty of fresh fruit on the nose but overlaid with oak and vanilla. In the mouth the wine is rich but dry, a classic accompaniment for me for paella. The 2007 Crianza Bobal has the cherry red characteristics and is medium bodied. A coffee cream nose from the oak gives way to a very easy drinking, smooth, rich and well structured wine for easy drinking or good food. By contrast, the 2000 Gran Reserva is even deeper in colour, displaying far more oak, balsamics and hints of its longer ageing. There is also more alcohol on the nose although the wine is 13%ABV. Rich, deep, dry…another wine for serious meat dishes! Pago de Tharsys is a pioneer bodega in making Requena´s Cavas. Four cava´s now helped to clean and then excite the palate as well as demonstrate why it is not necessary to buy Champagne here in Valencia. The Brut Nature is a wine of 80% Macabeo and 20% Chardonnay , from vines with more than 20 years of age, rigorous selection and 16 months on the lees. Pale straw in colour with tiny but persistent bubbles the wine has a strong patisserie nose, white flowers, satsumas. Very clean and fresh attack, great fresh acidity the cava enjoys real honeyed depth, cream and the finish is long and marked by the scent of white flowers. Wonderful cava! The Brut Millesimé Rosado is the award winner. The Gran Medallo d´oro has only been awarded seven times and only once to a cava whose salmon/onion skin colour suggests rather more of a French Champagne than Spanish Cava. Pure Garnacha from 2007, a reserva with 24 months on the lees, this has red fruits on the nose, strawberry, raspberry, and hints of the yeasts. In the mouth a big wine, fresh, balanced , great acidity but long fruity finish. Finally we tasted the Gran Reserva. 80% Macabeo with 20% Parellada, 35 months on the lees before disgorging we are enjoying a cava which blends peach, melon, orange peel on the nose with brioche. In the mouth, deep with a citrus marmalade, long finish, very satisfying. This year Ana Suria of Pago de Tharsys was president of the fair and the bodega´s cavas in particular stood out for me. Bobal is being developed, experimented with and is exhibiting some very enjoyable results. Last year Pasion de Bobal from Sierra Norte was highly rated by Parker with some raised eyebrows in the region…mind you Parkers Spanish organisation also raised eyebrows, losing Jay Miller his Iberian `expert´ part way through. 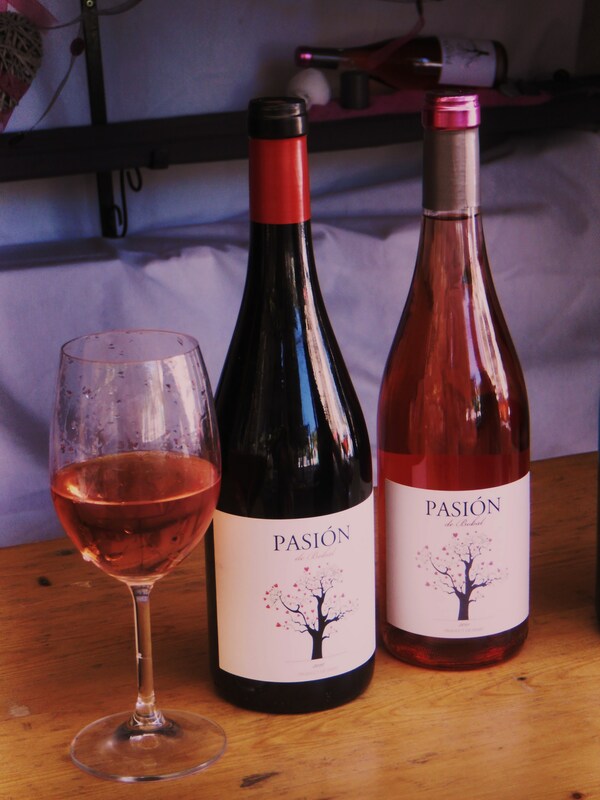 No doubt about Pasion de Bobal from 2011 though, either the Rosado or the Tinto. The rosado is salmon pink, clean and very bright, on the nose elegant, fresh, slightly tart nose, floral, with none of the usual bubble gum. Here is a dry, satisfying, mineral, fresh, crisp, wine. Stunning! The 2010 Tinto, Pasión de Bobal has had six months in oak, a light crianza. A potent, young style wine, very deep cherry red with spices, chocolate and coffee cream, blended with thyme, wild herbs. A big mouthful and very pleasant style of wine, distinct. I have enjoyed this twice recently with both chuleton and Moroccan style spicy koftes which were perfect matches for the powerful fruit. The Bobal from Bodegas Cerrogallina has been exhibited in the past but I have not seen them in the last couple of years. This may well be because this small production boutique bodegas wine is in high demand with those who know how good it is! From nearby Campo Arcis, the 2009 made by José Hidalgo for owner Santi Vernia comes from 90 old vines `en vaso´. The wines spend 18 months in fine-grain French oak, then develop in bottle without any chemical treatment or preservative. They are designed for long ageing and the bodega believes this wine has at least another 10 years development in bottle to come. A deep black cherry with purple edge, it is 13.5% ABV An elegant nose with lots of black cherry fruit, in the mouth, round tannins and nice mature fruit, quite short finish this wine needs longer development…….to lay down! Over at Vereda Real, the Requena bodega Pedro Carcel has been experimenting with some interesting mono-varietals. Covilor used to make a Bobal Blanco, a white I think from red grapes in its Sucésion range. Pedro has found a small perfectly formed parcel of Bobal Blanca ( a white varietal) and has made 700 bottles of wine from it. There are those who doubt the existence of the variety…. 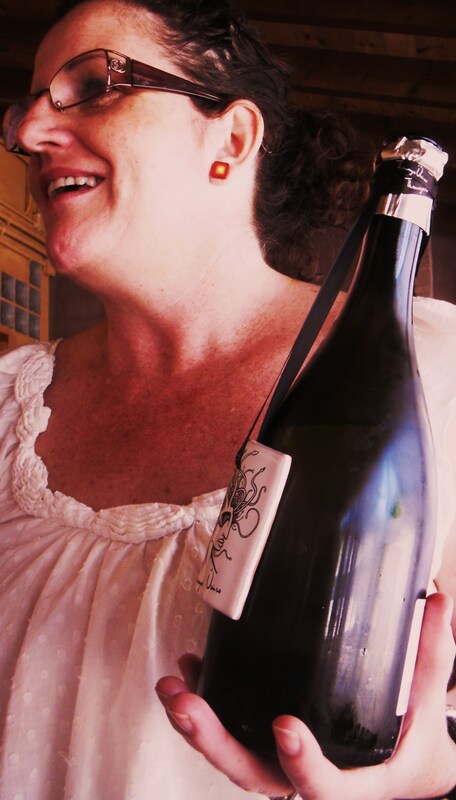 (see Verema´s forums at www.verema.com) but the wine itself deserves critical acclaim regardless. A pale old gold wine with gold flashes, clean and bright with a nose full of white fruits, peaches and in the mouth, creamy, smooth, a lovely fresh acidity. Never mind the arguments I want some of this….not for curiosity value but because I loved the wine! They also produce a white from Tardana another of the regions local varieties….rarely used although Torroja make a pure mono-varietal and one or two others use it in blends. Some believe Tardana to be Plantafina de Pedralba, a now sadly no longer produced white from DO Valencia. Again a very pale, old gold wine, quite brilliant on the eye, floral but very dry on the nose. In the mouth it showed minerals, hints of white fruit and as it opened up, round and full with a very long dry finish. I want some of the 652 bottles of this as well! Finally they have been experimenting with a red variety, Moravia Agria, which is found across the border in nearby Castilla la Mancha. From only 920 bottles, this is a deep black cherry wine with a blackcurrant edge. A volcano of fresh fruit on the nose with violets, spice and in the mouth, black plums and a persistent long mineral finish. A bodega to visit rapidly as their standard range also enjoy some interesting experimental methods. Dominio de la Vega produce stonkingly good wines as well and I have written about many before. On our tour this time we selected two, a Sauvignon Blanc with light oaking and the Cava from Pinot Noir to show how two French varietals produce Mediterranean style wines of immense quality. The tropical fruit flavours of the first and the fresh, red fruit flavours of the Pinot Noir cava proved to be the favourites of the fair for visitors from Vilamarxant and Pedralba´s wine clubs! 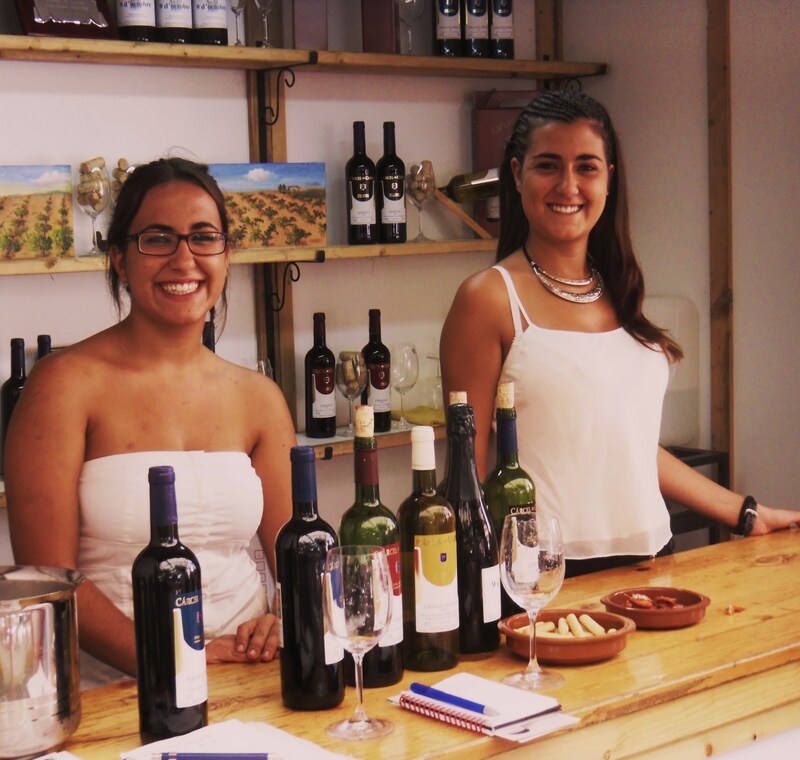 For them and other visitors exposure to the regions wines has opened up a greater understanding of production methods, styles and just the sheer quality of wine produced in Utiel-Requena. Very few regions can produce such a range of wines from local and noble varieties in such a consistent manner, along side Cavas of such depth, quality and regional character. If President of the Fair this year, Ana Suria , was hoping for the best of the regions wines to exposed to visitors….and vice-versa…..she can be well pleased with her efforts! Our search for new Bobal and other new wines and bodegas continues unabated! Ana Suria and Tharsys Unico.